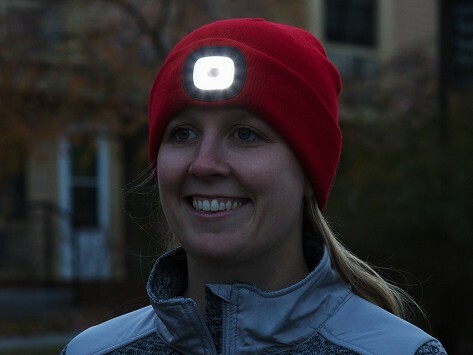 This LED beanie is a bright idea on a cold night. The USB-rechargeable light has three levels of brightness that let you see and be seen in the dark, giving you hands-free visibility (and warmth) when camping, dog walking, shoveling, or anytime you need more light. Pop the removable light out to toss the hat in the washing machine. Dimensions: 8" x 8.5" x 0.5"
Works great! Light doesn't shine very far but enough to walk the dogs in the dark. My husband loves it and it’s so easy to recharge. I’ll definitely buy again. It makes a great gift. The bright light in this hat makes walking my dog at night and early mornings much more enjoyable & I feel safe!The illumination is great. The Night Scout beanie hat with light incorporates the ease of a USB-rechargeable light into the coziness of a warm knit hat. Getting ready to walk the dog, shovel, or go for a run or bike ride? Pull on this bright hat before you head out. It's a problem solver that is super helpful during the colder months when it gets darker earlier, and we think it’s also a great find for going hands-free in any dimly-lit environment. Think under the sink, out in the garage, or in the basement. The adjustable LED light has three levels of brightness and easily pops out to recharge or when you want to put the hat in the wash. It’s sized and styled to look good on men and women alike, making it a must-have for anyone who will be heading out in the dark.